If you’re going to use Ubuntu 12.04 LTS as your primary OS then you must install few basic things first (mandatory), then other essential programs as required. Download Manager is really very useful if you download a lot of stuffs directly over the http or ftp protocol (I mean, from browser, rather some other way like torrents). For downloading mp3 tracks from soundcloud, you can also checkout this web based tool : SoundCloud to mp3 downloader. Although your web browser (Firefox is installed by default) also provide some options to manage downloading but it doesn’t has much features. So you may try some download managers that can easily resume/download stuffs without any hassle. 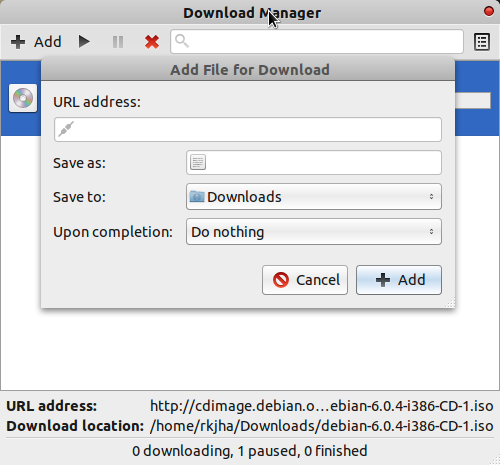 Steadyflow is a simple and easy to use download manager, written in GTK. It has a lot of good features without any unnecessary complexity. Download process is quite simple – just add the URL, choose destination (you can also go for default) or trigger some commands or actions upon completion (it’s not necessary but you can if you want to). So it can easily handle parallel downloads. Tray icons is very helpful in quickly accessing/controlling the application. Note : Steadyflow is one of the top 10 coolest application – so you might be interested in checking out my post- 10 Apps You must try in Ubuntu 12.04.
thank you. i tried multiget and wxdownload fast .will try above.